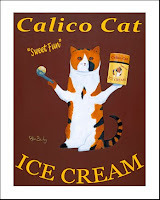 Ken Bailey Calico Cat Ice Cream limited edition prints now available. Also custom prints where a cat's name replace the Calico Cat. Go tohttp://www.kenbailey.com The original is also available. All ship within a few days.